"Throughout its history, the United States has remembered its military heroes in many ways, with plaques, parades, statues and memorials. The Home of the Brave Quilt Project was started to continue that proud tradition. We are a nationwide movement dedicated to honoring the fallen heroes of the conflicts in Afghanistan and Iraq by making and presenting homemade quilts to their families. We want to show our gratitude for their service and provide a measure of comfort to their families with our quilts." 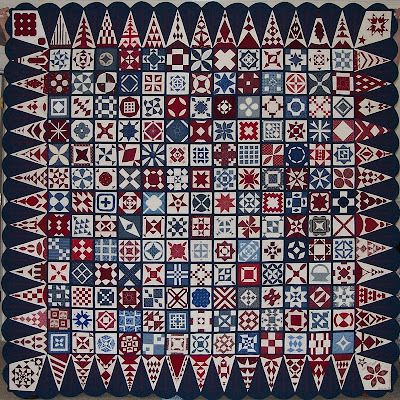 The quilt is modeled on a Civil War Sanitary Commission Quilt, one of the five remaining quilts of its kind still in existence, which is now held by the Lincoln Memorial Shrine at the A. K. Smiley Library in Redlands, California. Above, we're showing three of the beautiful quilts made by Jean Loken, who is the Coordinator of the Minnesota Chapter of the Home of the Brave. For information on the heroes who received the quilts, visit the Minnesota Fallen Heroes web pages. To contribute to the project with a donation of money, material or time, visit the national project's home page. Jean says that the project also relies on the occasional request from the families of our fallen to ask for a quilt: "Not all deaths of our service members occur on the battlefield, and when they don't, we often aren't aware of that." To find a coordinator for your state, see the list of State Coordinators. Credits and links: The images are shown with the generous permission of Jean Loken. 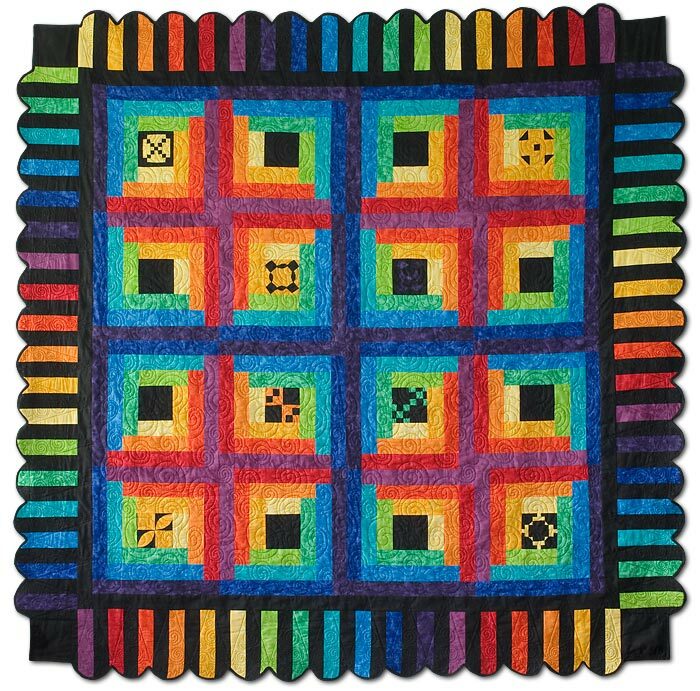 Quilters' Connection is a dynamic group of 400 quilters and quilt enthusiasts in the greater Boston area. The Quilters' Connection 33rd annual quilt show will be held Friday through Sunday, June 4–6, 2010, at the Arsenal Center for the Arts in Watertown, MA. 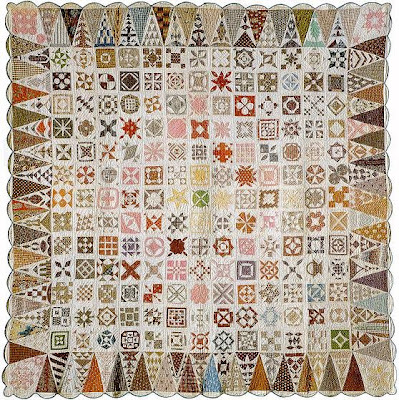 The exhibition of over 200 quilts, many of which are for sale, will include pieces ranging from classic to cutting edge. 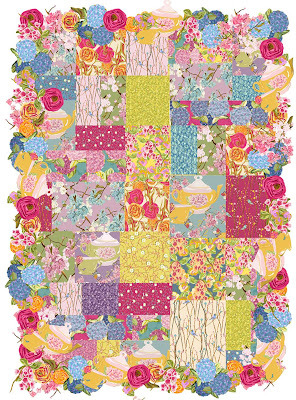 We're smitten with the 2010 opportunity quilt, Modern Linoleum, which will be raffled off on Sunday, June 6. 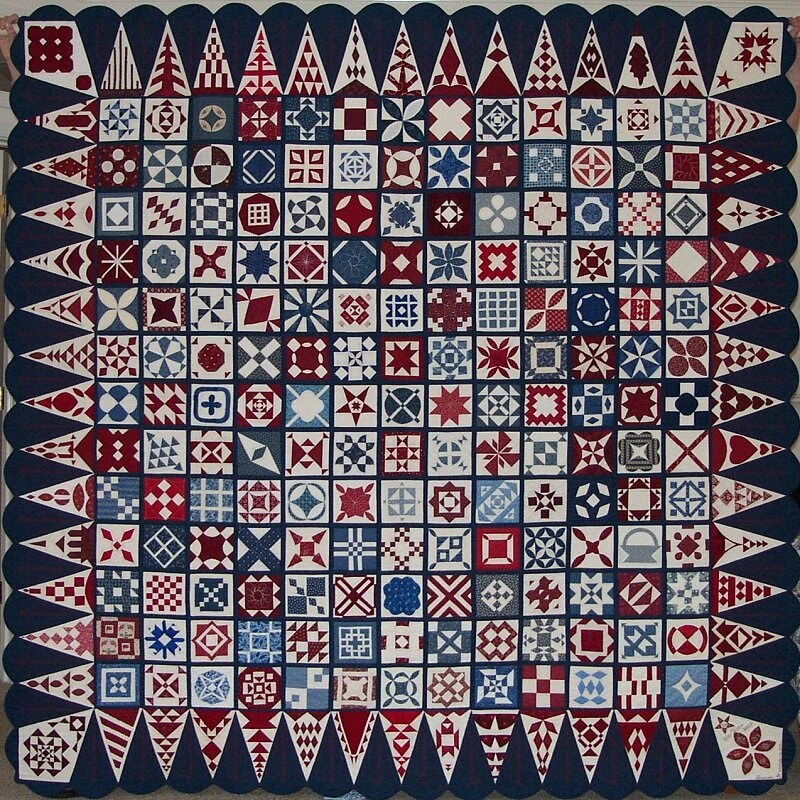 For more details visit the quilt show webpage. 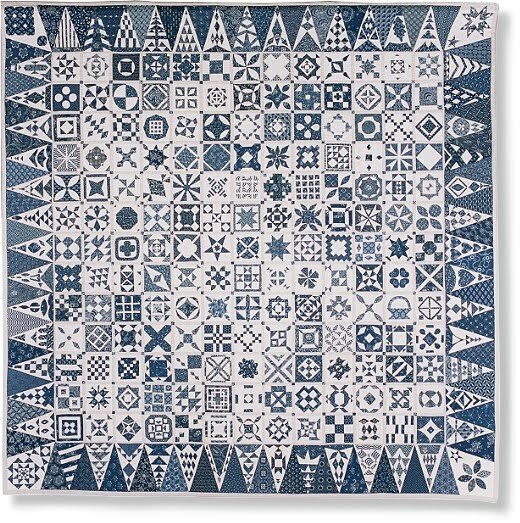 We love visiting the Quilters Connection website for its virtual quilt shows, with hundreds of images of quilts from previous shows: a treasure trove of quilt inspiration. For example, here is Sunset-Moonrise, the 2006 raffle quilt, which is a doublesided quilt designed by Mike McNamara and Sylvia Einstein (how clever is that)! For more information on Sunset-Moonrise, click here. 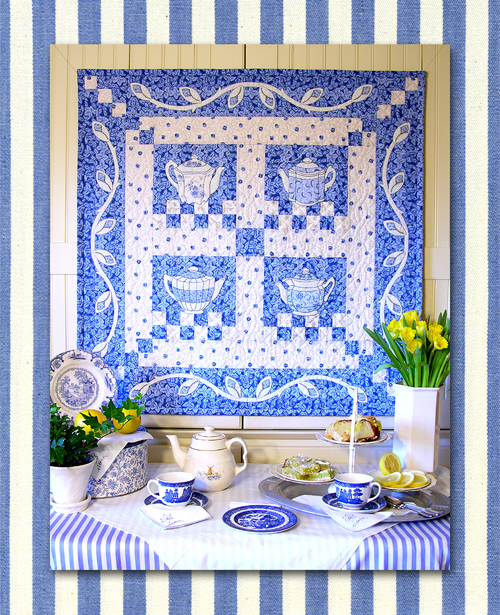 Also see the links to on-line galleries on the quilt show page. 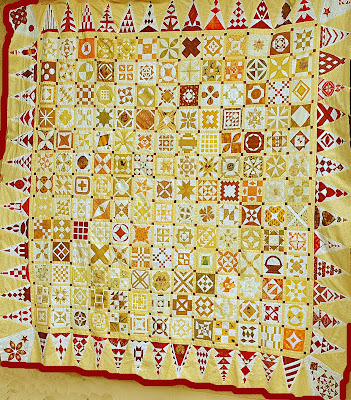 Images were provided with the generous permission of the Quilters Connection. Scented with the the fragrance of sugar cane and tropical flowers, the trade winds have blown in an exotic collection of Hawaiian quilts. Come along with us on an island adventure ! Long ago, the Hawaiians learned to make their own cloth, called "tapa" by pounding Mulberry tree bark and fibers tightly together. They colored it with natural dyes from their environment and sewed it into bed coverings, using thin, twisted vines and needles made from fish or bird bones. 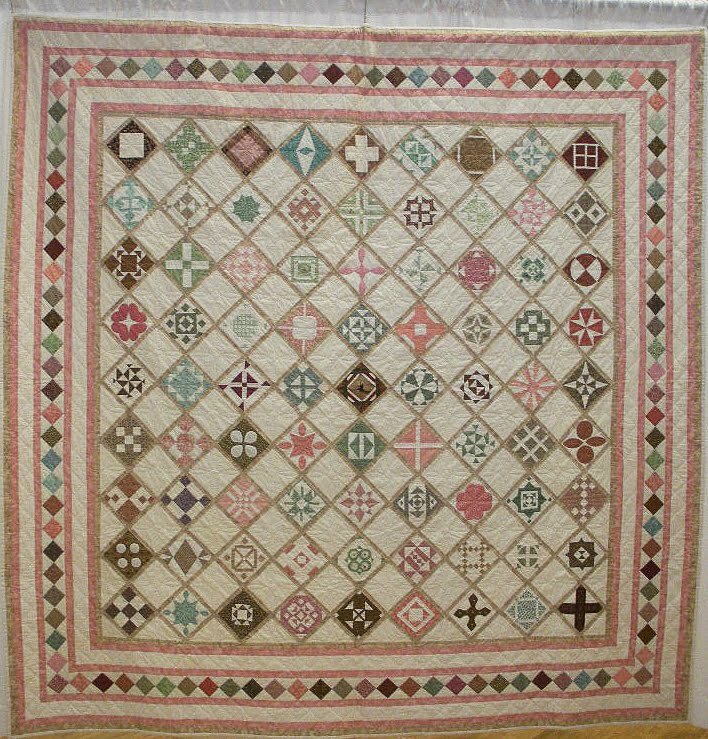 When the 19th century missionaries brought cotton to the Hawaiians, they transferred their skills onto cloth, using large pieces of fabric, instead of small patchwork squares. 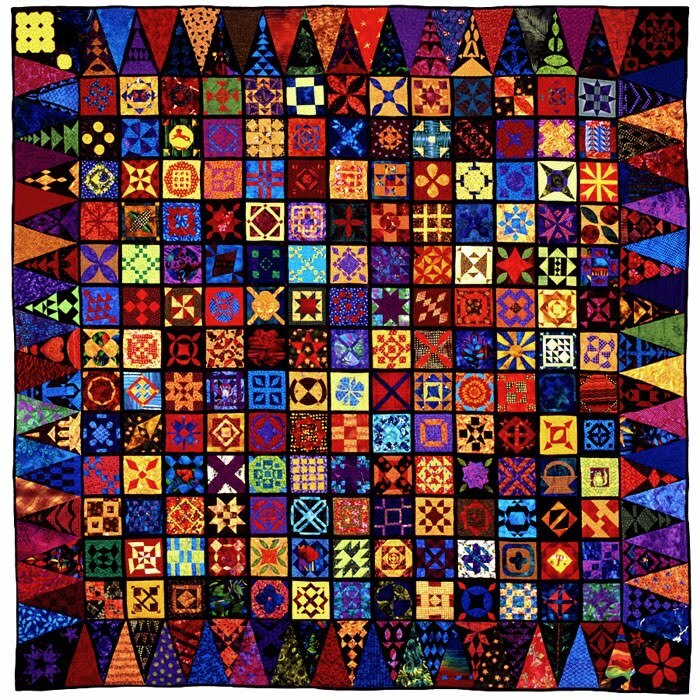 Today, Hawaiian quilts are still made in the wholecloth style, with vibrant curved patterns painstakingly hand-appliqued with thousands of tiny stitches. 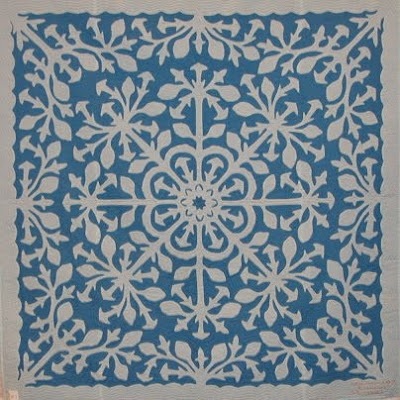 The applique fabric is usually folded into fourths, then cut into intricate shapes, as one would cut snowflakes or conjoined dolls from paper. 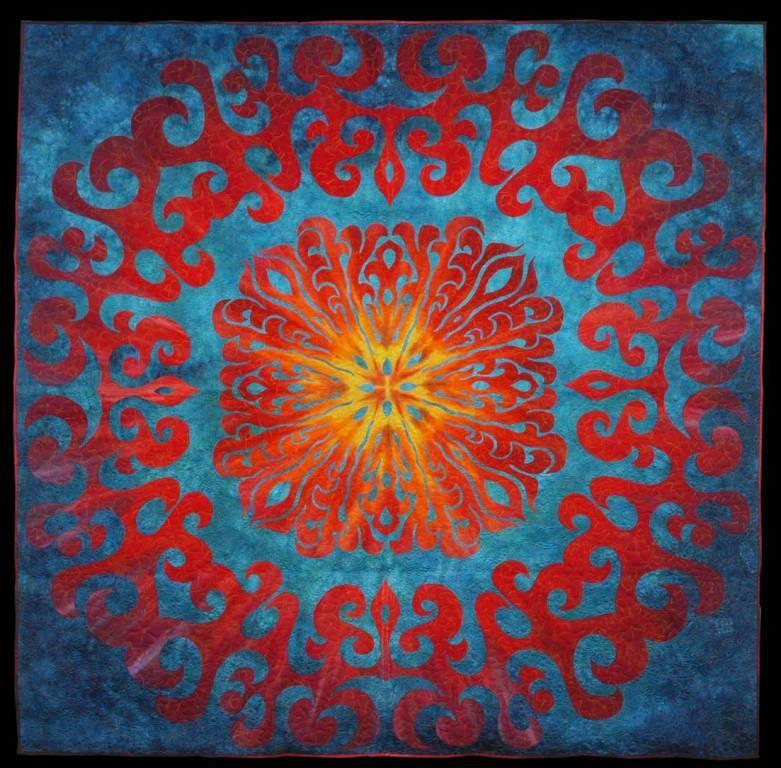 Another magnificent work of art from Deborah Kakalia is her Nanahonua quilt, or Angel's Trumpet quilt. The Angel's Trumpet tree produces large, colorful, bell-shaped flowers, reminiscent of celestial trumpets. Nanahonua means "earth-gazing", an apt name since the Hawaiians learned to smoke the Angel's Trumpet leaves as hallucinogens. 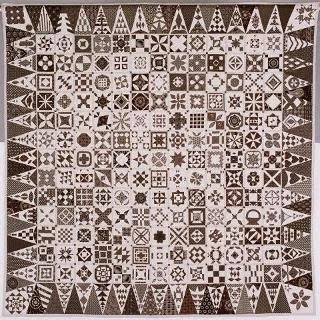 However, one would have to be perfectly sober to create a quilt this intricate and precise, which almost looks like a beautiful lace handkerchief. 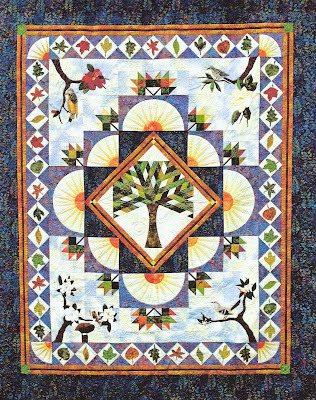 Nalani Goard, who is the granddaughter of Deborah Kakalia, has designed and constructed many lovely quilts, so this fabulous talent obviously runs in the family. 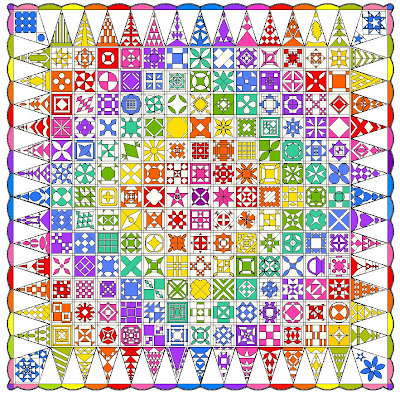 Here is a quilt that Nalani created for her brother, Kulaniakea. She writes that he wanted a design of pineapples and guava for hospitality and strength. Nalani's work is an excellent example of large, leafy quilt patterns which reflect the lush vegetation of Hawaii. 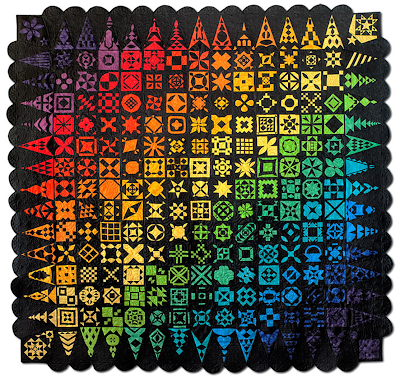 Nalani also offers design instruction, quilt kits, and finished quilts at her Hawaiian Quilting website. 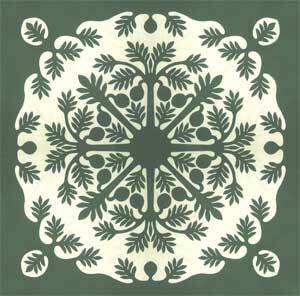 From the Pacifc Rim Quilt Company website comes the pattern for the esteemed and venerable breadfruit. The breadfruit tree is a symbol of abundance and an ancient legend tells us that those who make Ulu their first quilt will always enjoy prosperity. Above, the round shapes of the breadfruit form a "ring of plenty" around the star created by the intersecting branches of the tree. 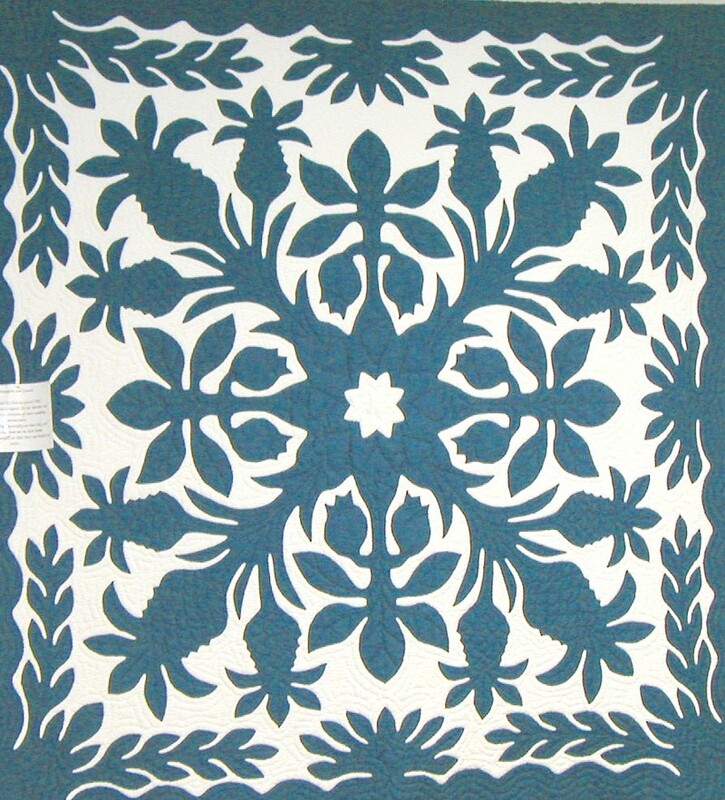 PRQC offers a wide variety of Hawaiian quilt patterns, kits, fabrics, videos, and notions. Tiki Master, which sells all things Hawaiian, recently featured this arresting dark green and white wall hanging of the breadfruit pattern. The rounded breadfruit here are easily seen here at the base of the outer leaves of the tree. It is said that one day in the 19th century, some Hawaiian quilters were outside, working on pieced patchwork, when one of them noticed that the sun behind a breadfruit tree was casting a fascinating shadow on the grass. The shadow of the breadfruit tree interested them so much more than patchwork, that they immediately went to work on creating a wholecloth image of that shadow. 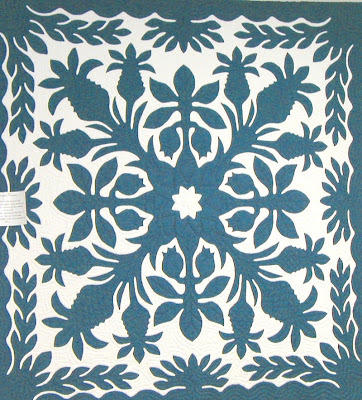 Thus, the first truly Hawaiian quilt was born. Here's a quilt which is as lushly green and refreshing as a Kauai rainforest. 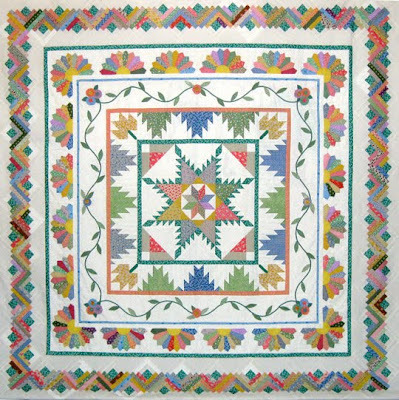 This four block quilt is a variation on the traditional Hawaiian wholecloth quilt. Kerry Marksbury has created a fabulous quilt with blocks depicting the auspicious Ulu, dignified sea turtles, pineapple plants, and tropical blossoms, possibly Hibiscus. 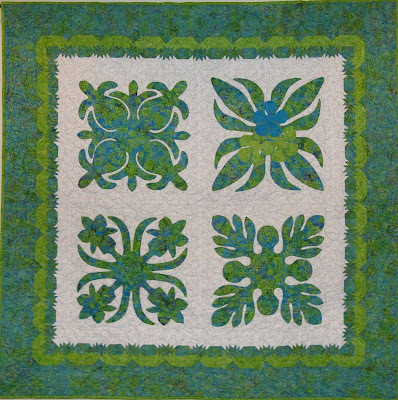 The lighter green scalloped middle border provides eye-catching detail to the blue/green batik outer border and block motifs. Notice the innermost aqua border, which provides a fanciful grasslike fringe effect to complement the emphasis on flora and fauna. 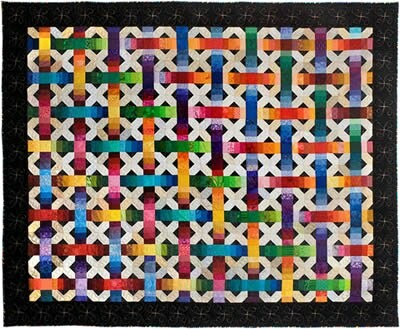 For more fascinating quilts, please see Kerry's Quilting. Using custom dyed Ultra-Sateen fabric from Jeanette Viviano at Jeanette's Fabric to Dye For, Cydney Brooks creates a tribute to another of Hawaii's natural wonders, the volcanoes of the Big Island. 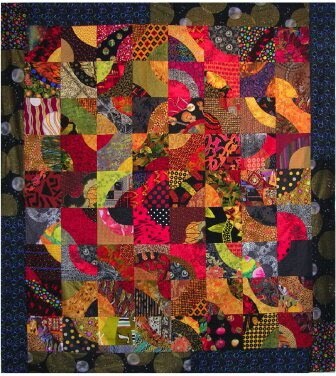 Jeanette and Cydney collaborated on the fabric colors, and Janet Fogg quilted this vibrantly colorful work. The orange and gold glowing embers and flickering flames of the center medallion give rise to the swirling, meandering trails of lava as they make their way down the mountainside to the ocean. This is an exquisite use of contrasting colors, as the orange applique seems to pulsate with movement against the serene aqua background. 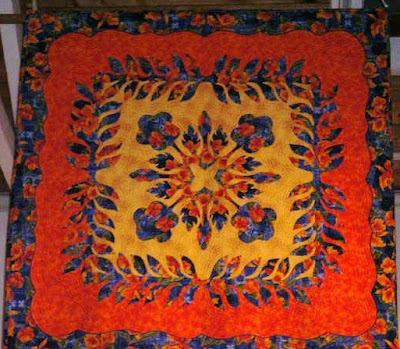 A gorgeous quilt inspired by the islands' beloved Hisbiscus flowers is Carol Kamaile's "Hibiscus Fire". 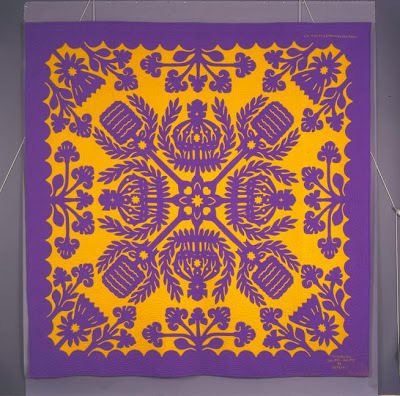 Carol is a well known quilt artist, whose creations are current on display at the San Jose, California, Museum of Quilts and Textiles, through August 10, 2010. Native to Hawaii, the hibiscus plant comprises thousands of varieties, in all flower colors from delicate white, through bright pink, pastel pink, coral, yellow, and red. It is interesting that Carol has made the center of her medallion golden yellow, as the yellow Hibiscus is the State Flower of Hawaii. Allen and Ipo Camara are the owners of Hawaiian Style Quilts, which provides magnificent custom quilts, tailor made to the customer's request. 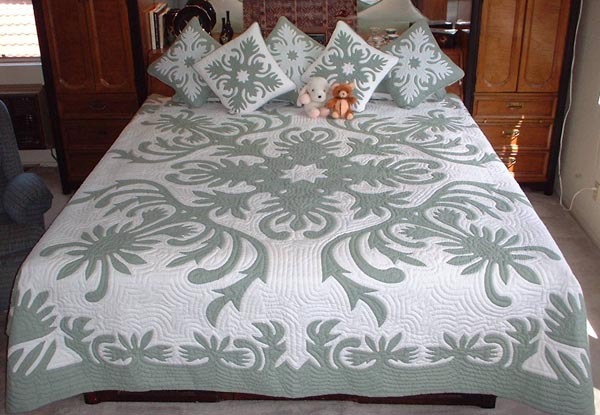 On this elegant gray and white large bedspread, with its artful matching accent pillows, you can see a clear example of the traditional outline stitching done on Hawaiian quilts. The quilting pattern carefully follows the outline of the applique shapes, starting out as parallel lines and turning into concentric rings, until all the background is filled up. Also known as "echo quilting", outline stitching helps give Hawaiian quilts their lively sense of motion and energy. 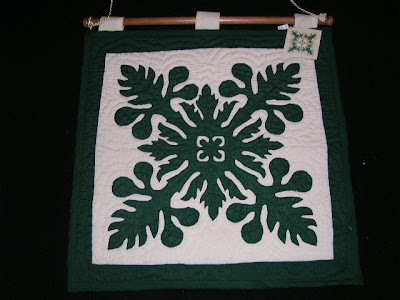 Books: For more fascinating patterns, ideas, and instructions, please see the following books: Hawaiian Applique by Vicky Fleming, or Hawaiian Quilting: Instructions and Full Size Patterns for 20 Blocks, by Elizabeth Root. 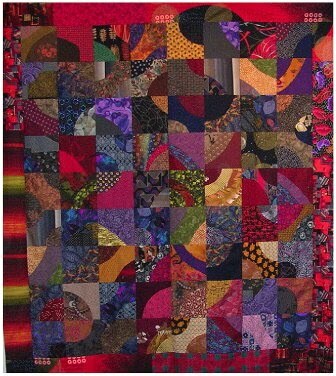 Don't miss the chance to win this quilt... it is indeed a treasure! 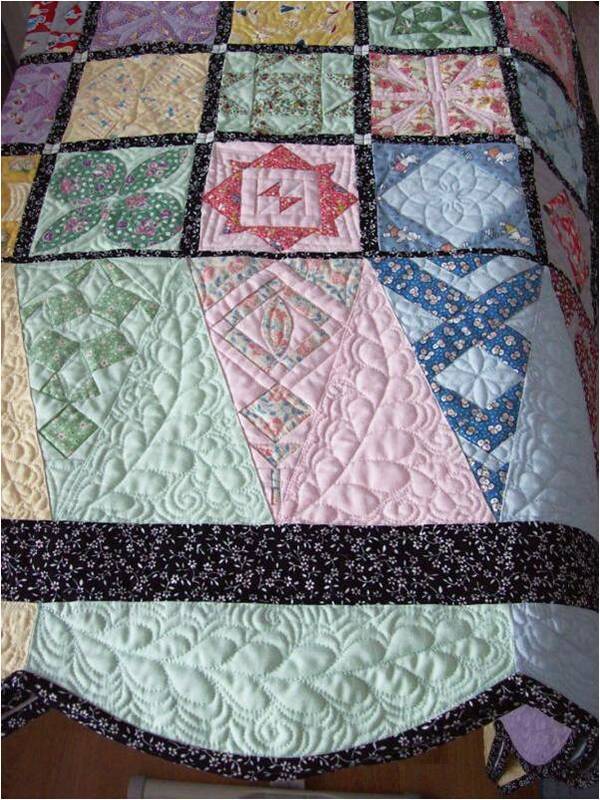 The quilt has an appraised value of $4350.00, and the lucky winner will receive the documentation from a certified quilt appraiser, along with photos for insurance purposes. Print these raffle tickets and send completed tickets with check to: Ilaine Hartman, 4617 Henican Place, Metairie, LA 70003. And, if you're going to be in LA the weekend of June 18-20, don't miss this show (that's LA as in Louisiana, folks, not L.A. as in Los Angeles.) The show location is Northshore Harbor Center, Slidell, LA. 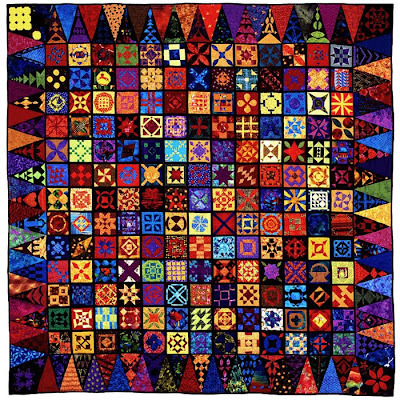 Credits and links: The quilt was designed by Jane Ramee, Judy Holley and Sherry Herringshaw. Judy Holley constructed the central oak tree. The quilt was long-arm machine quilted by Joan Knight (Pratville, AL). The photo is by Ilaine Hartman and is shown with generous permission. For complete information on the guild, visit their home page. June is nearly upon us, along with several outstanding quilt shows (and opportunity quilts!) 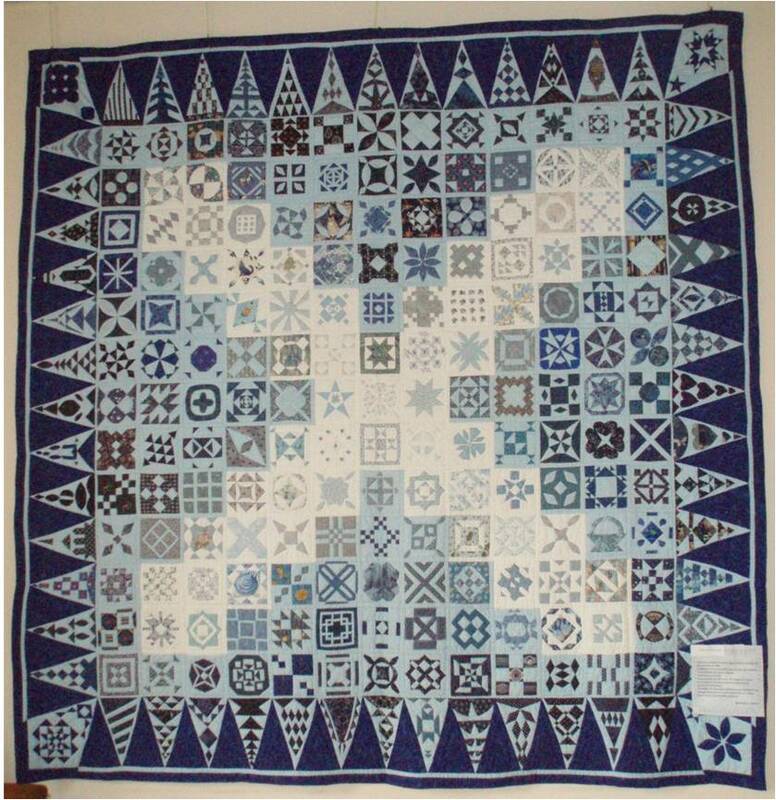 Today we're featuring the annual show of the Beach Cities Quilters Guild in Southern Orange County, California. The Beach Cities Quilters are known for their outstanding applique work, as evidenced by "FantaSea of Beauty", below. This magnificent opportunity quilt was designed by Sheryl Smith-Bailey and machine pieced, hand appliqued, and hand quilted by guild members. Notice the intricate detail on the floral bouquets, and the perfect white-on-red sashing between the blocks (click on the image for an even larger view). And, you can participate in the raffle - and perhaps win this masterpiece - even if you can't attend the show. What an opportunity! Raffle tickets are only $1 each, or 6 for $5 (which is less than the cost of a fancy cup of coffee). It's easy: contact Elaine Pappas-Puckett at 949-831-1072 and she will give you the address to mail a check. 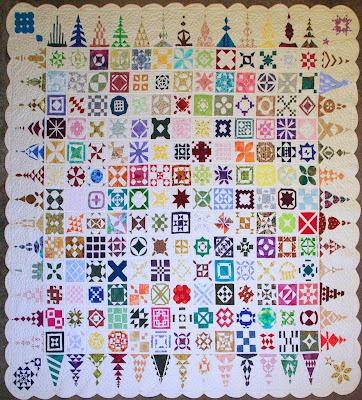 The quilt will be awarded Sunday, June 6, 2010, at 3 pm. For complete details on the FantaSea of Quilts show, visit the show website. 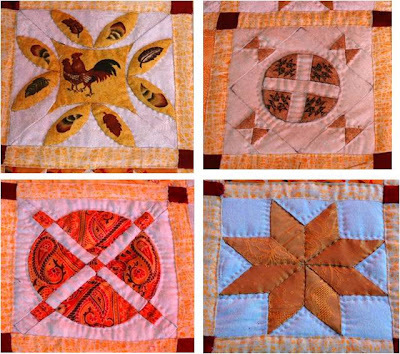 Image credits: Thanks go to the Beach Cities Quilters Guild for the photos, and for the inspiration. 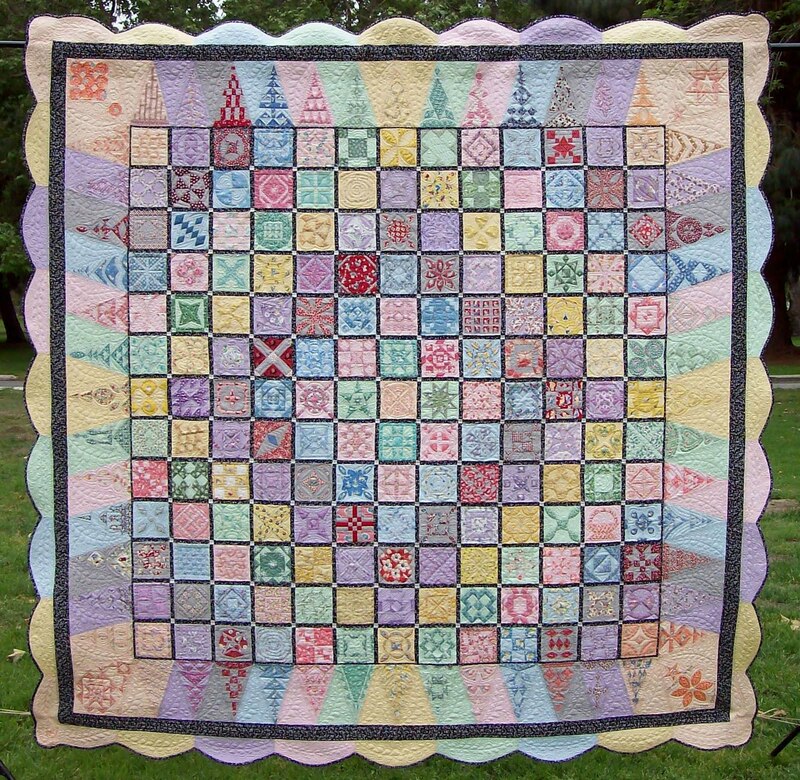 We're excited about this glorious 1930's style Round Robin quilt. 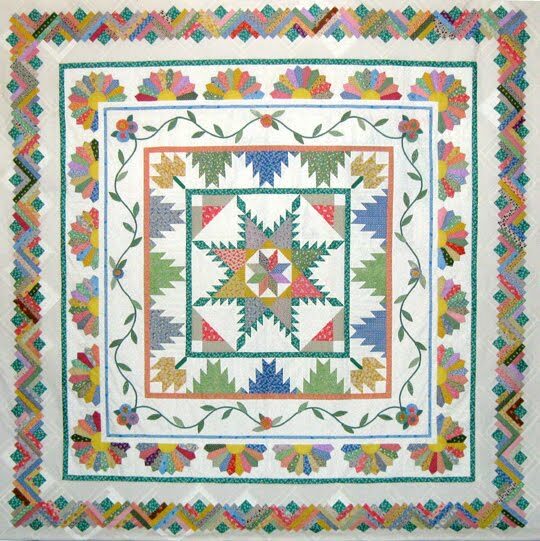 The quilt will be proudly exhibited - and quilted by hand - during the West Virginia Quilters Quilt Festival, June 24-26, in Summersville, WV. The design and piecing of this beauty was done by five different guilds from around the state. The center medallion features a feathered star, with a LeMoyne star in the middle. 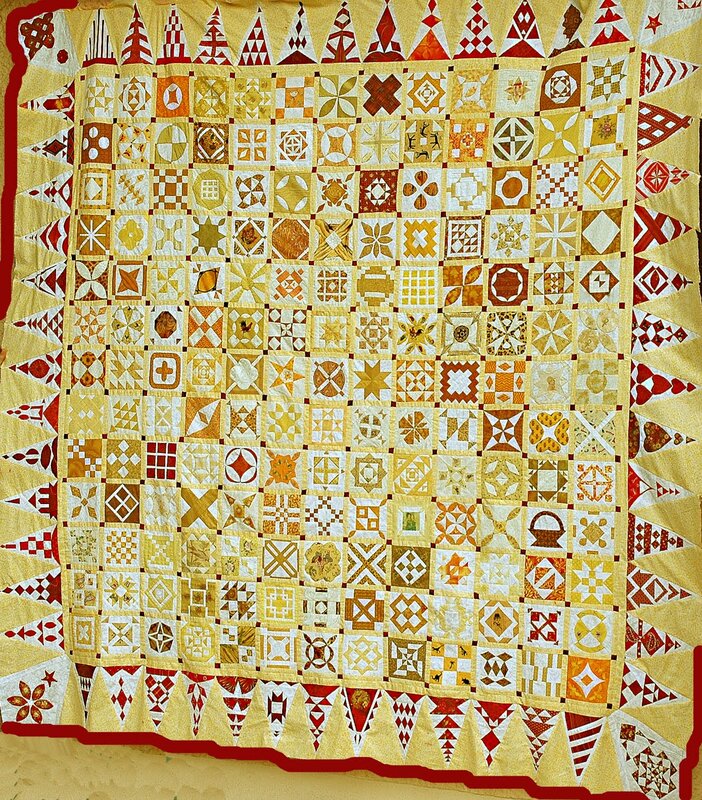 The feathered star is surrounded by four borders: delectable mountains, with maple leaf motifs; appliqued flowers and vines; half Dresden plates, with sunny yellow centers; and double log cabin blocks, set on point. The rounded shapes of the Dresden plates echo the curves of the leafy vines. The colorful prints, which are set against a white background, help to create a vibrant design. 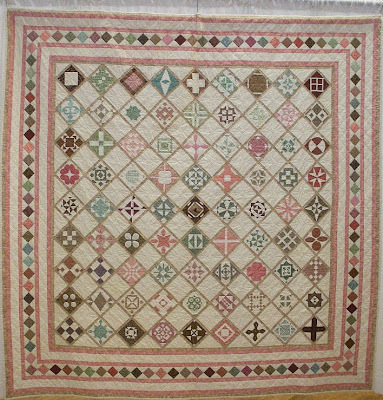 The entire quilt, which will be approximately 93" square when finished, will be hand quilted during the Festival. And if you can't attend the show, you can still participate in the raffle! 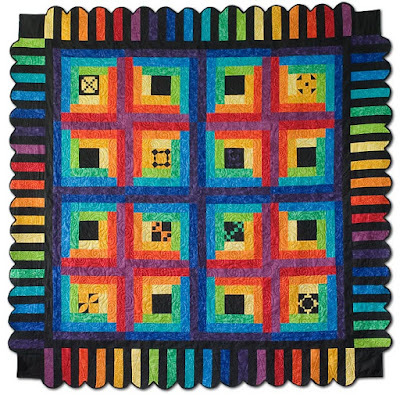 3) The purchase of raffle tickets helps support a fellow quilting guild. 4) Wouldn't it be fun to win? * The odds of winning a lottery jackpot are 1 in 14 million. 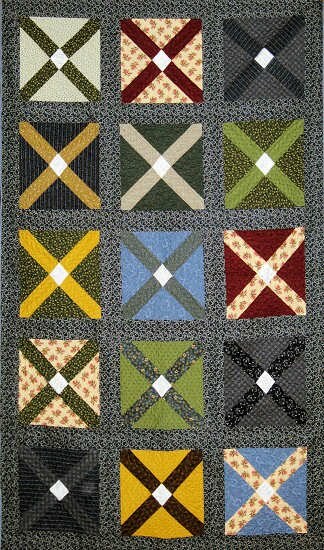 The odds of winning a quilt are 1 in 2000, if 2000 raffle tickets are sold. 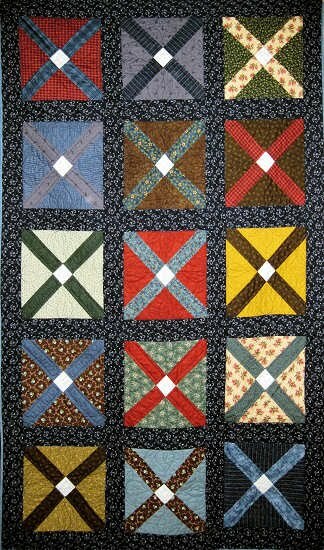 Therefore, the relative odds of winning a quilt vs. winning a jackpot are: 1/2000 divided by 1/14,000,000 = 7,000-to-one. The odds of winning the quilt will vary with the number of raffle tickets that are sold, and the number you purchase! ** The price of a triple grande soy vanilla latte is now $6.25. See the coffee story here. 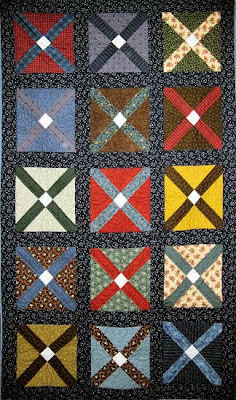 Credits: Credits and thanks to the West Virginia Quilters for the inspiration, the photo, and for their generous assistance. 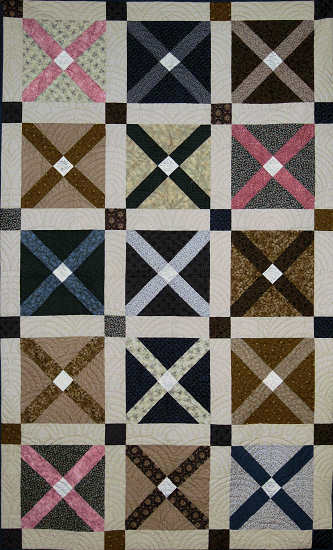 For more information on the guild, visit the WV Quilters website. Teapots make delightful collectibles. 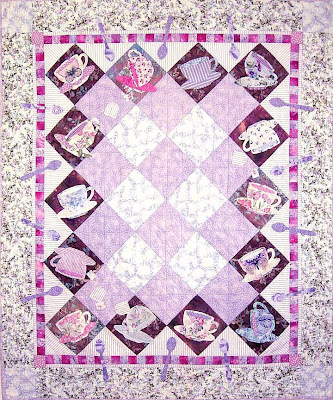 Plus, teapot quilts remind us of the joys of tea parties, tea ceremonies, and tea for two. 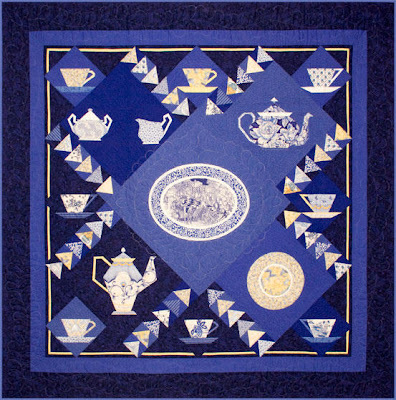 We've been collecting tea-themed quilts and have been dying to share them with you. As they say, life is like a cup of tea... it's better when shared with friends! 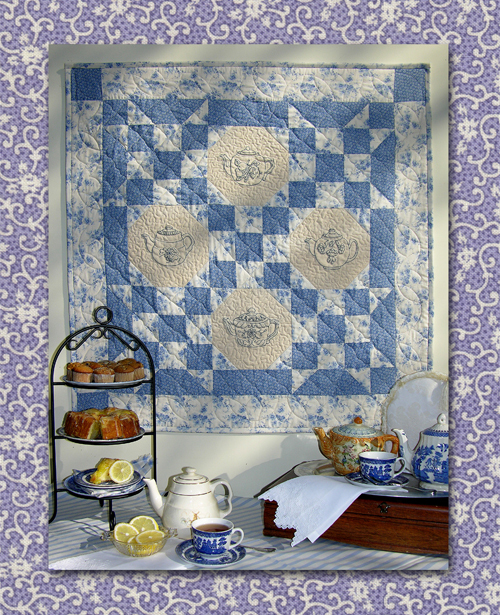 The "China" quilt by Laurel Anderson displays a complete tea set in Delft blues, surrounding a blue floral platter. Laurel explains that the quilt was made in honor of her grandmother, Charlotte, who loved beautiful things. 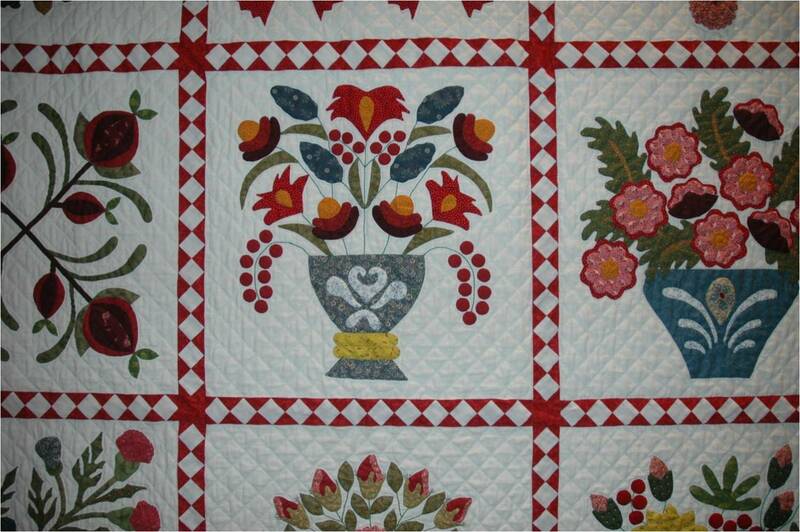 The quilt is made on paper foundations except for the hand appliqued plate and platter. 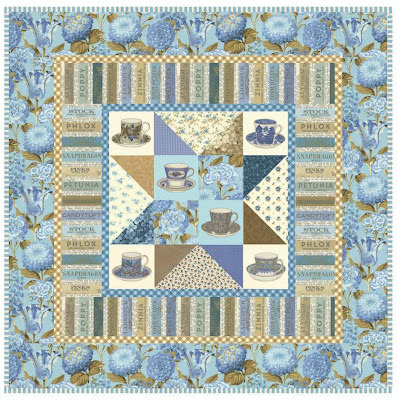 TeaTime Floral III is one of Holly Holderman's glorious designs; it has teacups in pale blue or ivory, hydrangeas, roses, and a songbird with speckled egg. The pattern for the Star Maker quilt, above, can be downloaded at the LakeHouse project page. Can a quilt be both beautiful and whimsical, at the same time? If the quilt is "Cupsey Turvey", then the answer is 'yes'. 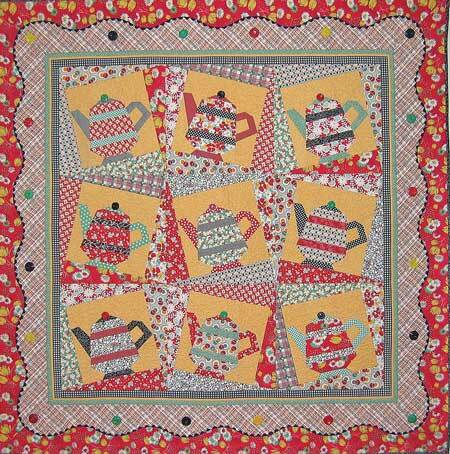 All fourteen cups are dancing, sliding and tumbling around the quilt, and some are even upside down! The cups are flanked by tossed spoons and the occasional flying teabag. "Cupsey Turvey" reminds us of this proverb: "A wise husband will buy his wife fine china, so she won't trust him to wash the dishes." 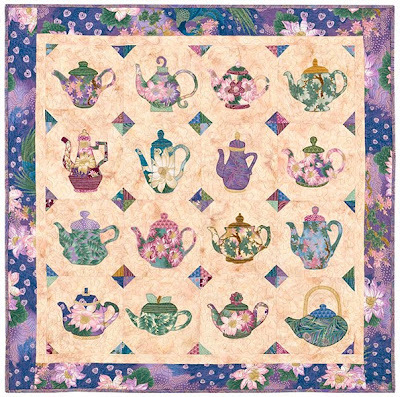 We love "Tea with the Empress", above, which features 16 shapely teapots from Kay Mackenzie's bestselling and definitive book, Teapots 2 to Applique. 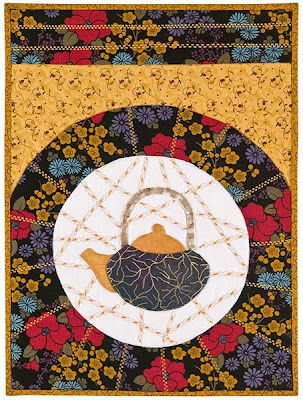 The teapots are rendered in peacock feathers, lotus flowers and Japanese maple leaves in jewel tones of teal, purple, and garnet. 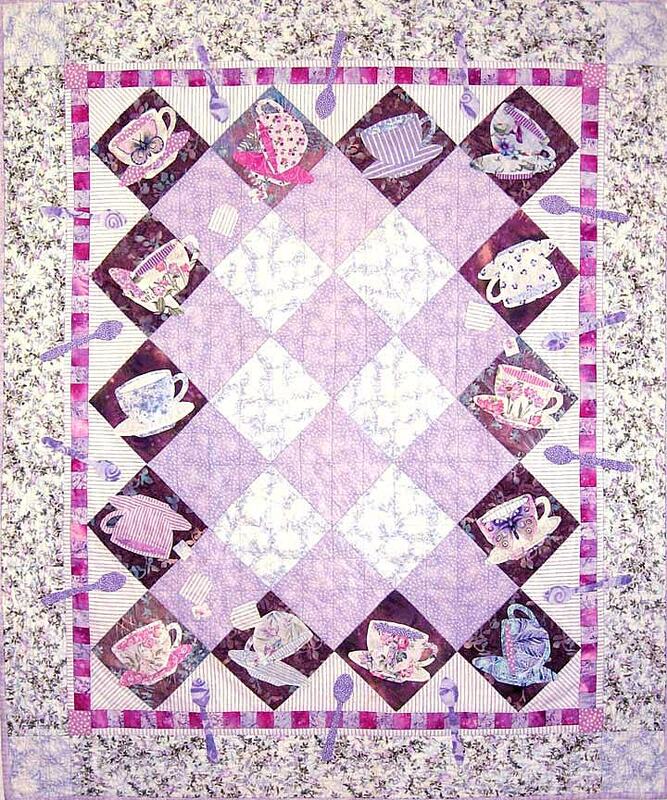 You can see the original quilt and read about the teapots at Kay Mackenzie's website, here. Connie Cerdena's classic and classy "High Tea" designs are inspired by her own collection of teapots; she began collecting at age 15. "Corner Tea Shop", above, replicates the cheery windows of an English tea shop, with its chintzware-like background and checkered tablecloth... notice the steam rising from the spout of the teapot! For more inspiration, see High Tea, Sweet Violet Tea, and Tea with the Earl. 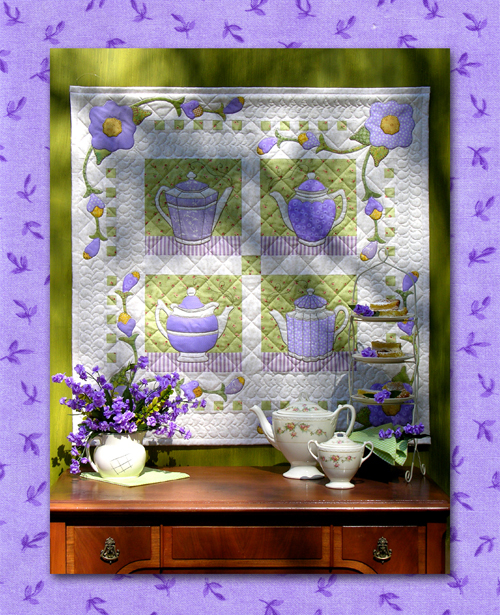 All of the patterns are available at Jenny Creek Designs. 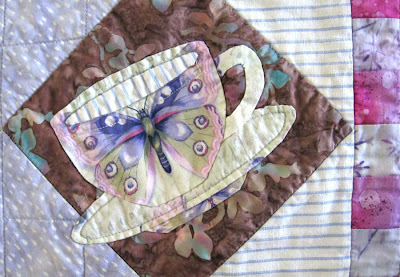 If applique is not your cup of tea... (get it?) ...then you'll love this versatile collection of six different teapots designed by Liz Schwartz and Stephen Seifert. Use one, or mix and match them to create a teapot quilt with your own fabric stash. 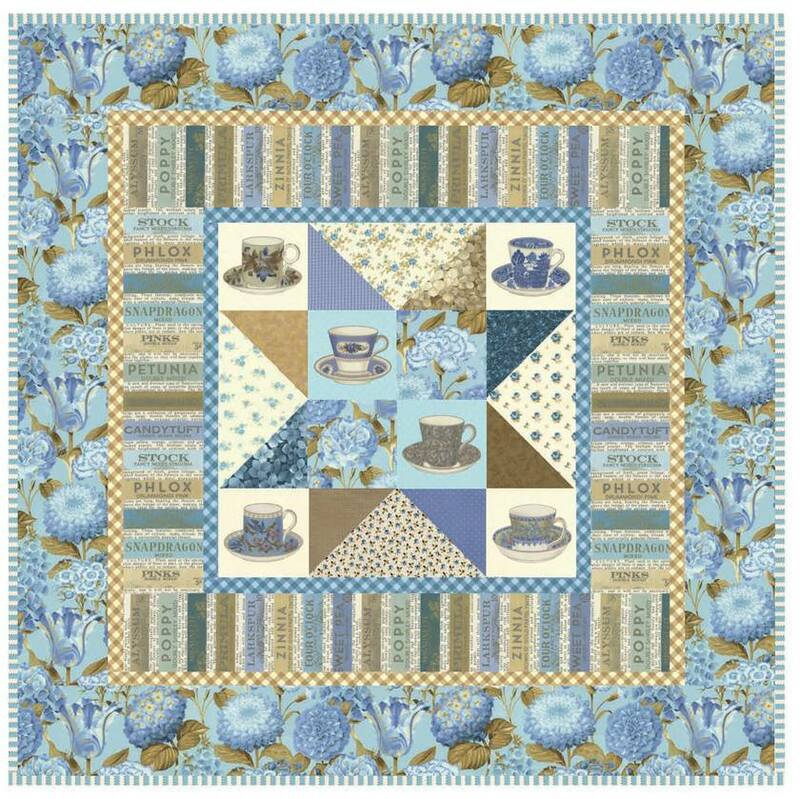 We're smitten with the "Garden Tea Party" quilt, above, which has a border decorated with collaged teapots and flowers from Bari J's earlier fabric line. 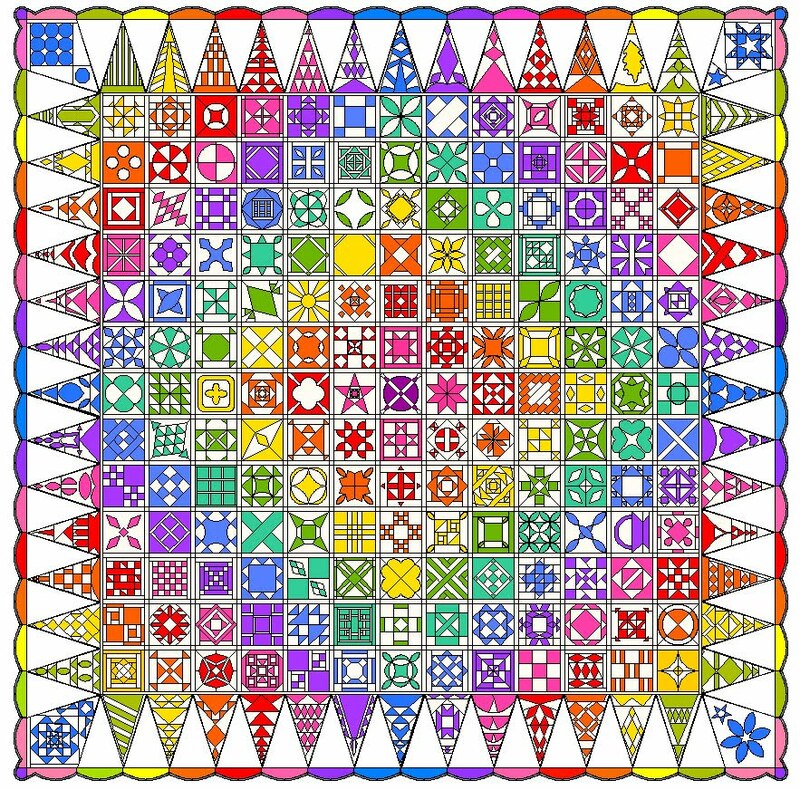 The pattern is free at Bari J Online. 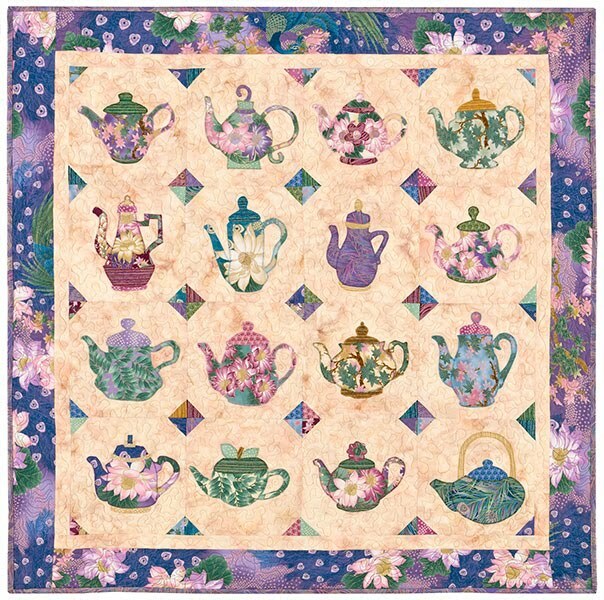 "Dancin' Teapots II", above, is one of our all-time favorite teapot quilts. 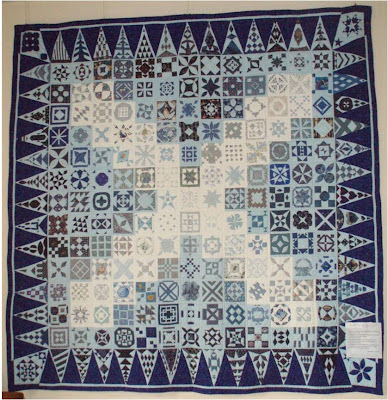 It won a blue ribbon in the small wall quilts category at the 2006 AQS show. For a downloadable foundation piecing pattern, click here. 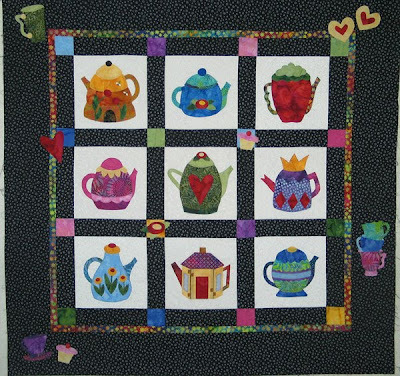 Dancin' Teapots II has inspired many quilters... see the brightly colored Funky Teapot quilt with its piano keys border. "Oriental Teapot" reminds us of a Japanese tea house, with its hand-appliqued batik teapot, Asian-inspired fabric and decorative quilting stitches. 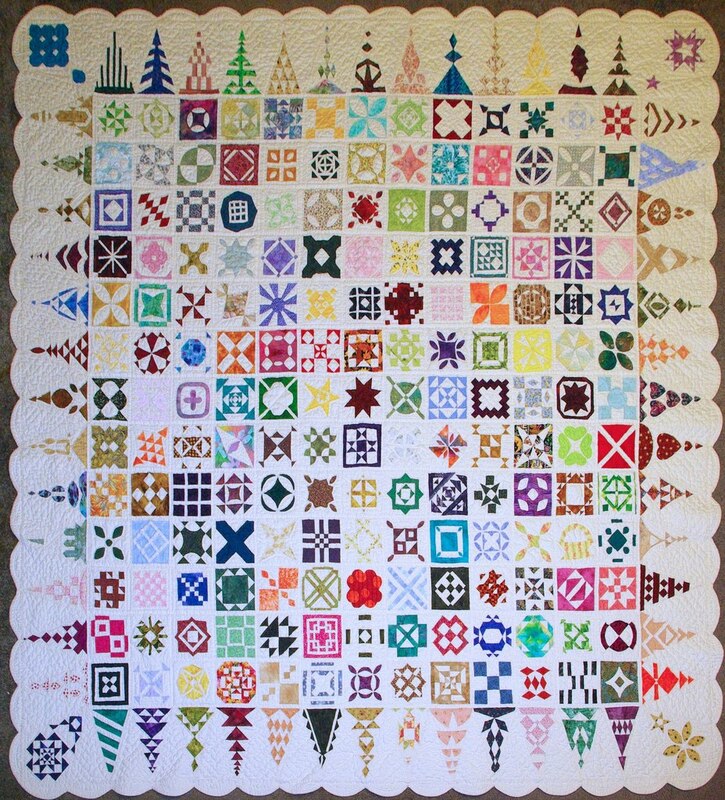 To read about the quilt on Kay's site, click here and scroll down the page. 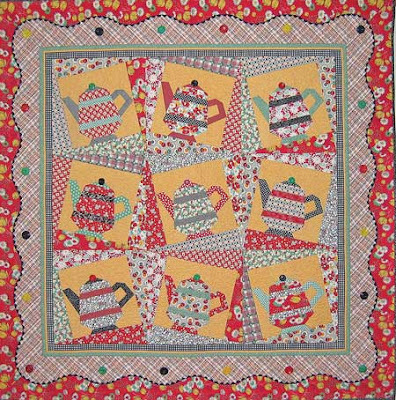 "Delicious Tea" features adorable apple teapots surrounded by apple fabric; it can be seen in Kay's quilt gallery. 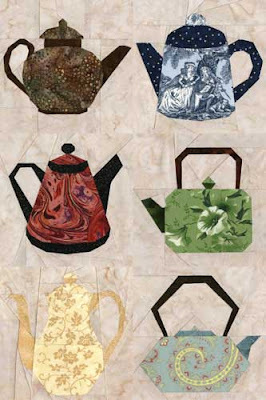 The teapots are based on the 2008 book, Teapots 2 to Applique. Kay also maintains a comprehensive site called All About Applique which is loaded with tips and tutorials. 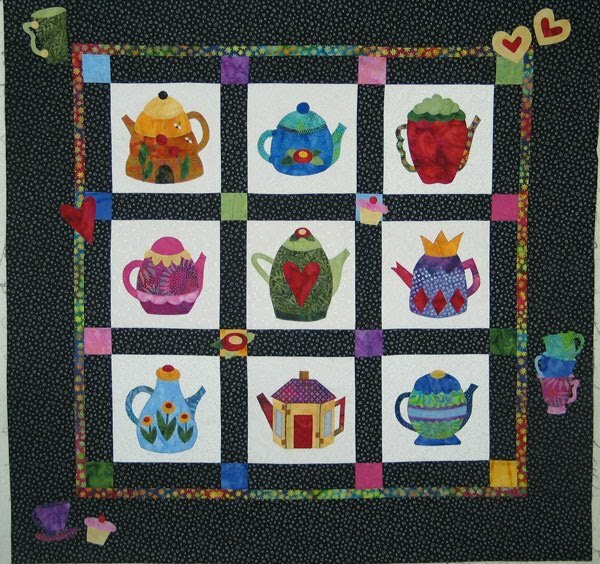 The whimsical Little Teapots quilt, above, was an original Cloth Shop design that uses white and black fabrics for the background and lattice, and wonderful hand dyed Bali Batiks for the appliques. 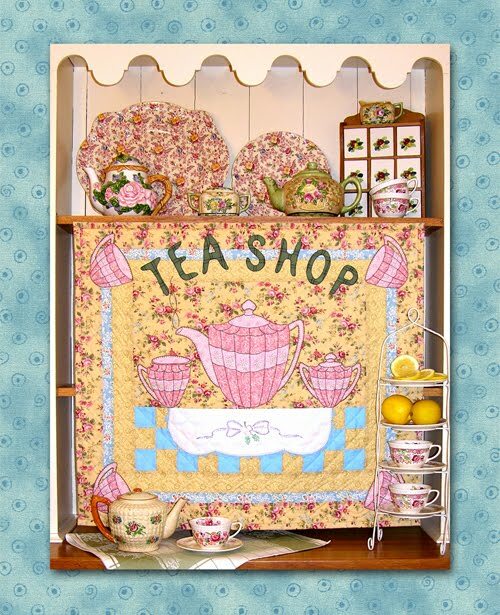 Teapots are shaped like a beehive, a house, and a strawberry, among others, and the teapots are surrounded by stacked teacups and little cupcakes ! A wool applique kit may be found at Out Of Hand. 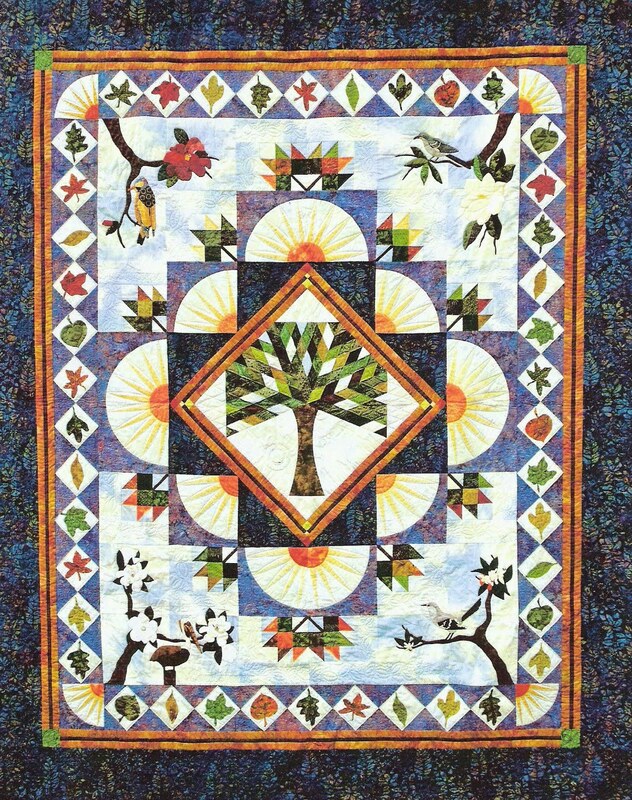 Image credits and links: Quilt images are shown with the kind permission of the artists.